On the roof of Casa Mila (aka La Pedrera), one of Gaudi's most famous architectural achievements and Karen's personal favorite. A chimney covering on the roof of Casa Mila (aka La Pedrera). The architect, Gaudi, was known for his elaborate designs. 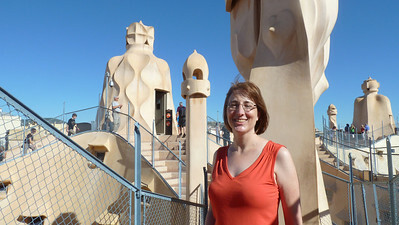 Karen poses on the roof of Casa Mila (aka La Pedrera). 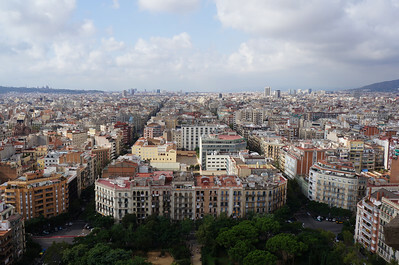 Not only a stunning rooftop in its own right, but it offers an excellent view of Barcelona city. 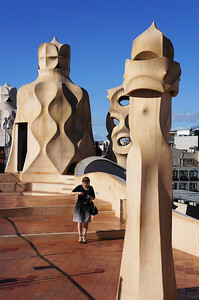 On the roof of Casa Mila (aka La Pedrera). 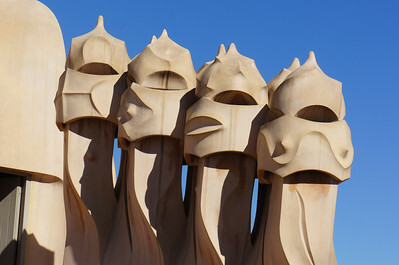 Gaudi's fantastical sculpturing over chimney stacks is one of the biggest tourist attractions in Barcelona. 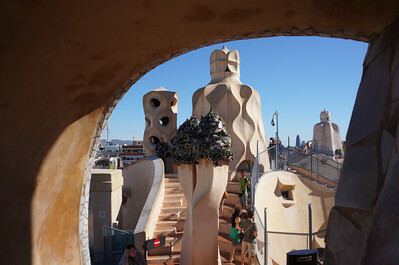 On the roof of Casa Mila (aka La Pedrera). Not only did Gaudi create a magical rooftop by sculpting around the chimney stacks, but he created huge arched passageways to frame his work. 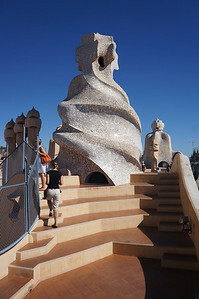 On the roof of Casa Mila (aka La Pedrera). This rooftop is the crowning achievment of an amazing apartment/office complex that Gaudi designed. One could walk for hours up in continual amazement. Additional chimneys on the roof of Casa Mila (aka La Pedrera), one of Gaudi's finest architectural achievements. 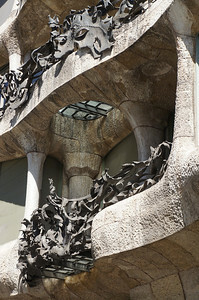 A close up view of a balcony on the outside of Casa Mila (aka La Pedrera). Gaudi's design of every aspect of this apartment/office complex with both magical and mysterious qualities. La Sagrada Família, the famous unfinished cathedral by architect Antonio Gaudí. 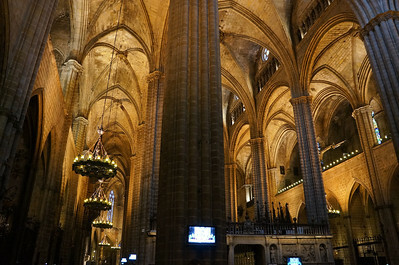 Gaudí died in 1926 with only 1/4 of the cathedral completed. 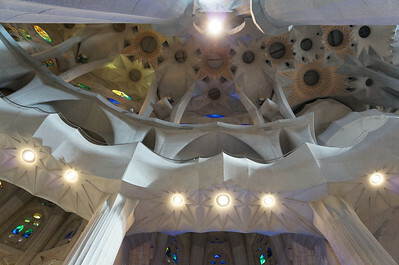 Completion is scheduled for 2026, the 100 year anniversary of Gaudí's death. 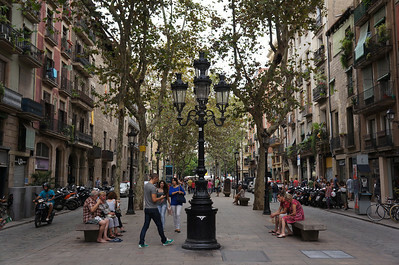 This was Matt's #1 'must see' attraction in Barcelona. 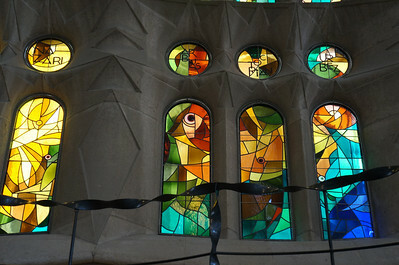 Stained glass windows inside the La Sagrada Família cathedral. 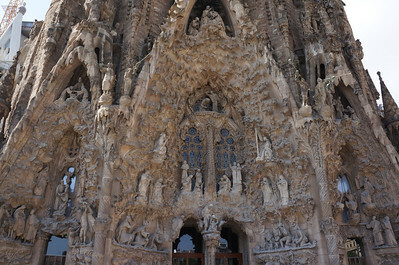 La Sagrada Família was designed with three entrances. 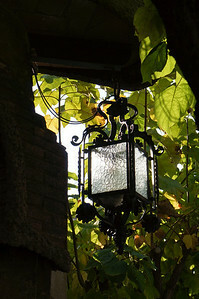 This is a view of the main entrance that visitors enter. 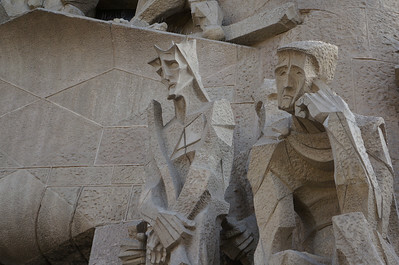 Above the entrance, a number of enclaves house sculptures depicting scenes from the life of Jesus Chris. Statuary in front of one of the entrances to La Sagrada Família. 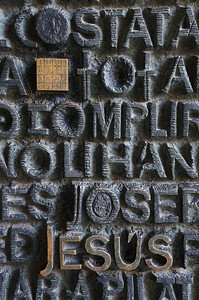 The gospel engraved in the doors to one of the entrances to La Sagrada Família. 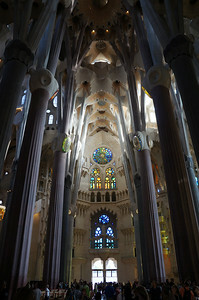 An interior view of La Sagrada Família. 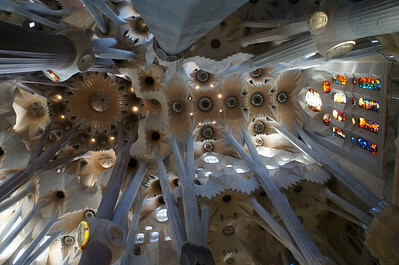 The ceiling of the cathedral, La Sagrada Família. There is not an inch of this immense church that does not have some thought or concept of it's architect, Antonio Gaudi, embedded in it. It is awe-inspiring and somewhat overwhelming. 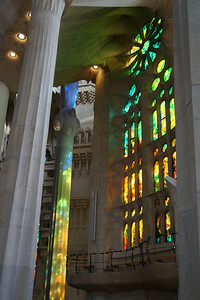 Karen was able to capture how Gaudi designed La Sagrada Família to allow the interplay of light onto his work. Stained glass window inside the incredible La Sagrada Família cathedral designed by Gaudi. 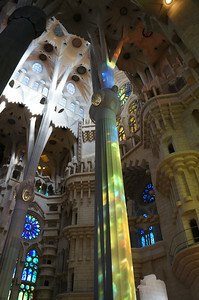 The sanctuary of La Sagrada Família with the light through the stained glass windows 'painting' the room in brilliant colors. 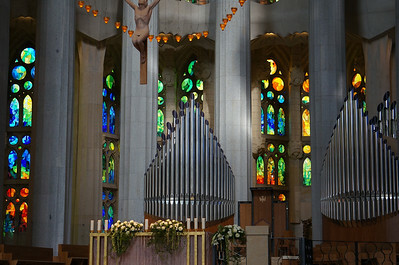 The altar, pulpit, and pipe organs of La Sagrada Família. 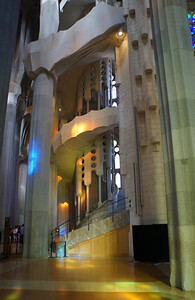 A large stairwell inside the La Sagrada Família cathedral offering visitors a chance to climb to the rooftop for additional views of the church exterior. 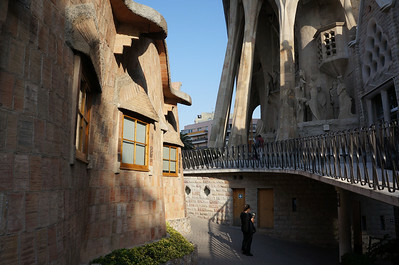 Stairways inside La Sagrada Familia allow visitors amazing views of the city. 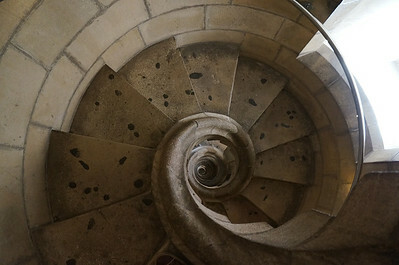 A view looking down the tower stairs inside La Sagrada Família. 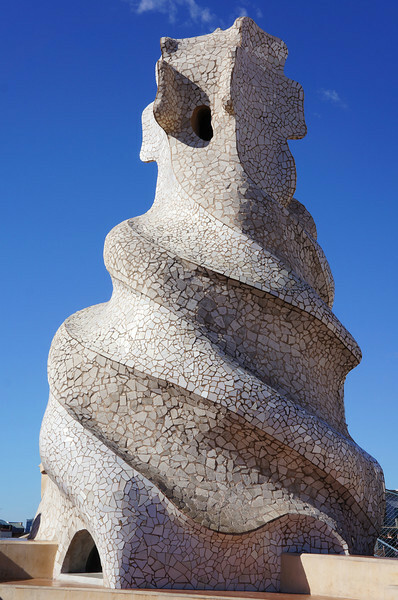 The architect, Antonio Gaudi, designed them to look like the shell of a nautilus. 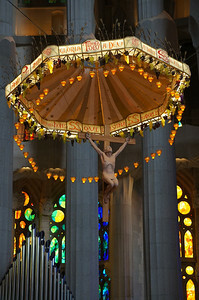 A view above the alter at La Sagrada Família. Antonio Gaudi created columns inside La Sagrada Família to resemble trees, so that when you looked up you could get the sense of being in a forest. 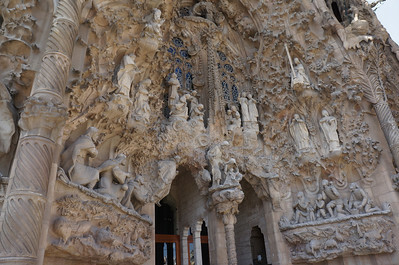 On the opposite side of La Sagrada Família where tourists come in stands the Nativity entrance. An intricately designed fresco detailing the birth of Christ and containing hundreds of creatures nestled into its design. 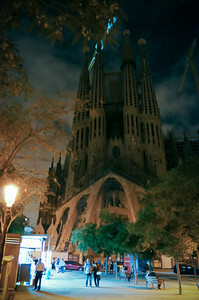 The Nativity entrance of La Sagrada Familia. The opposite side of the cathedral had a dozen or so scenes from Christ's life, but this side was crammed with so much intricacy that it was hard to take it all in. 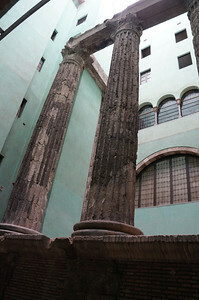 Roman columns housed within the Barri Gotic area of Barcelona. 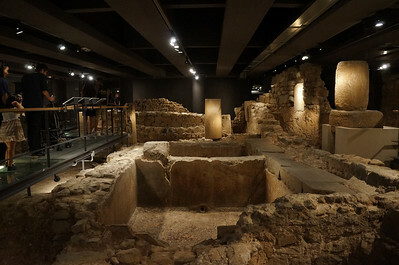 Excavations of ancient ruins below the city of Barcelona.